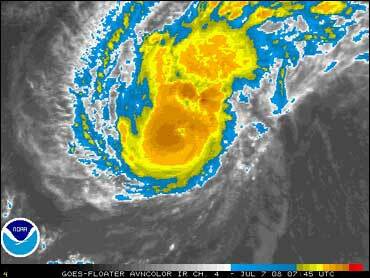 Hurricane Bertha continues to strengthen as it moves over the central Atlantic Ocean. As of 11 a.m. EDT Monday, the Atlantic season's first hurricane was centered about 775 miles east of the northern Leeward Islands. National Hurricane Center forecasters say Bertha is expected to turn in the general direction of Bermuda. It's still to early to tell whether Bertha will hit the island, but forecasters urged residents to monitor the storm's progress. Maximum sustained winds have increased to speeds of 90 mph with higher gusts. Some strengthening is expected during the next 24 hours, and forecasters say Bertha could become a Category 2 hurricane later Monday. Bertha is headed west-northwest at about 15 mph and is expected to slow down in the next couple of days.